Something nice about Marvel TV shows is that you don’t need to know anything about Marvel to watch. The shows are typically stand alone, and sometimes there are hints to other Marvel films, but it doesn’t change the storyline of the shows. 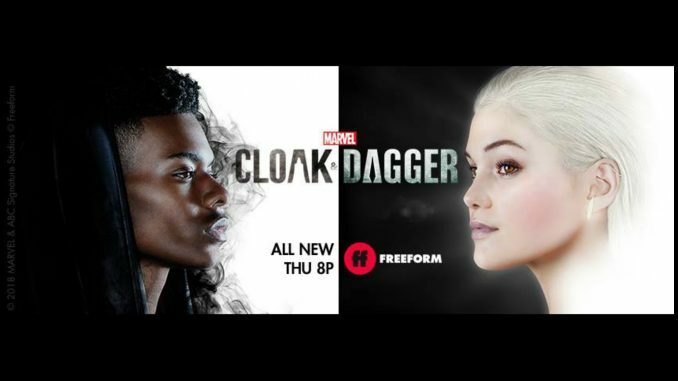 This makes Cloak and Dagger on FreeForm a great show to get into. I binged watched the series for this event, and now I am hooked. 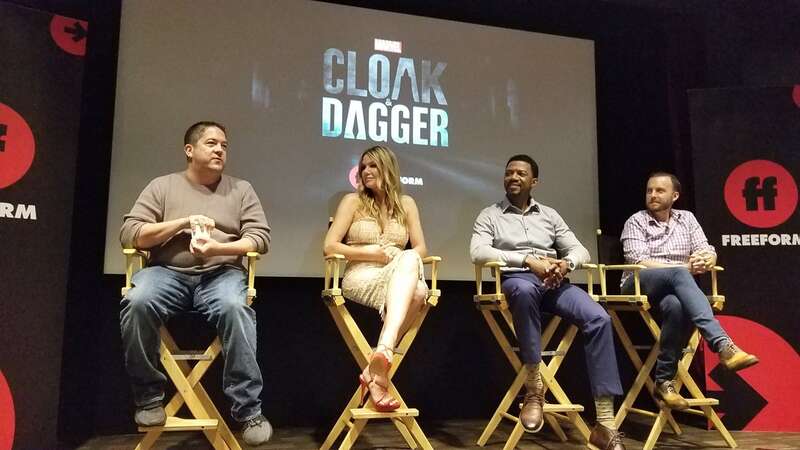 During the #AntManandTheWasp event, I also attended the #CloakandDaggerEvent where we got to sit down with Andrea Roth (“Melissa Bowen”), Miles Mussenden (“Otis Johnson”), Tom Lieber Vice President of Original Programming at Marvel Television, and Executive Producer Joe Pokaski. The show is based on Tyrone and Tandy, but Melissa and Otis have their own storyline going, so we got some insight about the characters on what that will be about coming up in future episodes. Tom Lieber: From the beginning, Joe crafted really interesting story arcs, not just for Tandy and Tyron. Joe had a vision for Melissa from the beginning. Joe Pokaski: I grew up with 3 sisters, so I get the mom-daughter dynamic. Someone once told me the hardest points in her life were when she was 16 and when her daughter was 16. That was kinda the basis for the Tandy/Melissa relationship. So you will see that the mother’s arch in this will be pretty heroic. Marvel was generous in opening their wallets getting us top-notch actors for this. We are not messing around, we want our drama to be solid. We also want to be different than anything else you see on television. Andrea Roth: I am playing a mom with a complex and interesting storyline. I am hoping as mom viewers, and dad viewers see that this show is for everyone. My friends are watching it, not just their kids. Miles Mussenden: The things that I find compelling about the show, is yeah, they are superheroes but are things that I think about as a father now. ANd I think about that for Tyron, the character. To be able to show that in a real way is tremendous. The show is shot in New Orleans. Joe Pokaski: We discussed it with Marvel, and we just wanted a different look. I always joke, but I am kinda of serious, NY is very well protected by superheroes. So when we started to talk about places and New Orleans came up, it felt like there were something very Cloak and Dagger about it. It is our most European city. It feels like it has a history older than our country. Will there ever be a crossover with other Marvel characters from the MCU? Joe Pokaski: If I have my way, yes, but for Cloak and Dagger, as you see in the comic books, any character can show up. So I hope maybe Aubrey (Tyrone) and Olivia (Tandy)will end up some places. It’s your last chance to vote for #Marvel’s #CloakAndDagger for #ChoiceSummerTVShow in the @TeenChoiceFOX Awards. You can vote up to 10x. Link in bio. #TeenChoice __________ Photo via @GettyImages. It rare that we see the family dynamic in Marvel tv shows, what are you hoping the conversations that will happen from the content of the show? Miles Mussenden: I think we have to talk about these things somewhat early. My son is 11, and he goes to Bible school. He was invited to a party in a park, it was prominently white. They were playing these war games playing with these machine guns that looked very real. I stuck around, and so did another mother of color. I think these are the conversation we need to have with our kids. Tamir Ricen was 12 and shot for having a bb gun. So I think we need to talk about a lot of things. Be aware of your surroundings. Who they socialize with, show me your company, and I will show you who you are. I think this is important to talk to my son who is 11 now. Tom Lieber: I have to give Joe credit for this too. Looking at the Marvel IP, we use the comic books as commentary. From day one Joe was not afraid from day one to dive into issues. He put together a well-balanced writers room gender and ethnicity. And a team of directors also with a balance of gender and ethnicity. Joe wanted the right people in place with different perspectives that could be done in a responsible way. 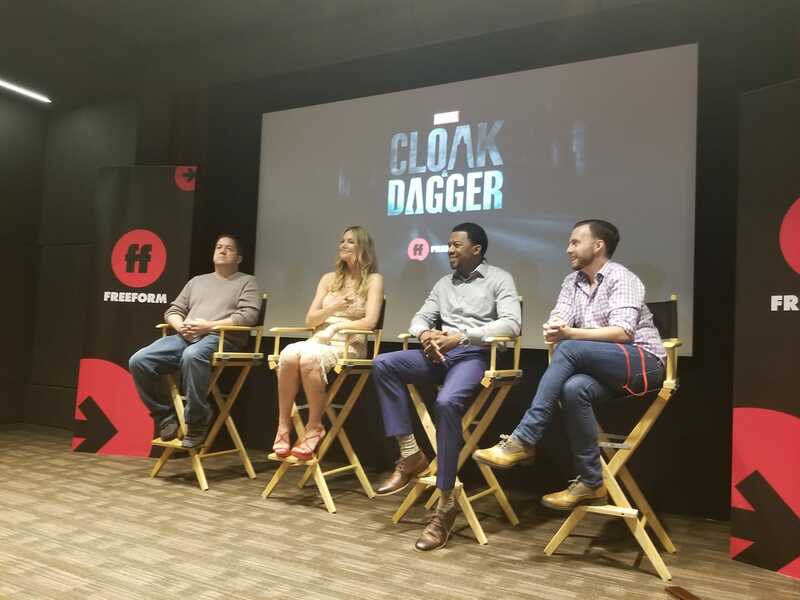 *I was invited by FreeForm to screen Cloak and Dagger and speak to the talent. All opinions are my own. Hey Buddy!, I found this information for you: "Cloak and Dagger on FreeForm". Here is the website link: https://www.trippinwithtara.com/cloak-and-dagger-on-freeform/. Thank you.